WCL is stands for Western Coalfield Limited India. This organization is looking to heir fresher Indian candidates for Mining Sirdar posts. The department is looking to fill up 333 total vacant positions through this WCL Recruitment process. We took this information from the official website of Western coalfield. We also share the official file link at the last of this article. 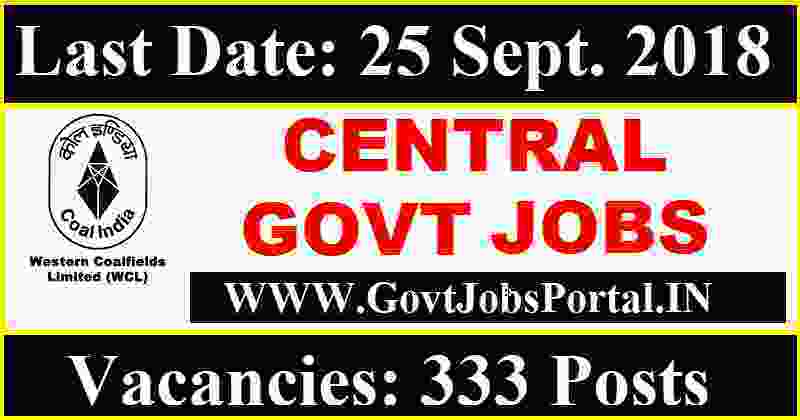 More information about these Government jobs in India is given below in this post. Read it through out for more information related to this Western coalfield recruitment 2018. Eligibility Criteria for this WCL Recruitment 2018? Those who have a Diploma in Mining and Surveying and a valid Gas Testing certificate. Age Bond: All Indian candidates can apply for these Govt jobs who have age on between 18 years to30 years. Those who lies in between this age criteria can apply for this Western Coalfield recruitment process 2018. What is the Application Fee for applying these Govt jobs? Great news to all eligible candidates that there is ZERO application fee for all candidates, who are wishing to apply this western coalfield recruitment 2018. No need to pay the application fee for applying these Government jobs. General Manager (P/IR)WCL, Coal Estate, Civil Line Nagpur-440001 on or before 27.09.2018. 27TH Sept. 2018 is the Last Date to accept application.